CiteAb: now more than just antibodies! Here at CiteAb we have recently developed our technology so that we can now collate data on multiple reagent types – not just antibodies. This means we can now give a picture of the global market for different types of reagent, in the same way that we have for antibodies. Our founder, Dr Andrew Chalmers, said: “Through the new technological processes we’ve developed our team is now undertaking projects involving chemical probes, proteins and ELISAs. 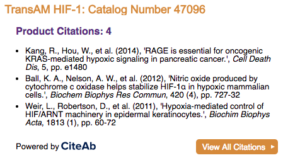 CiteAb’s widgets provide an up-to-the-minute live list of academic papers and the reagents they cite direct to your website. Michael Murray, product manager for Active Motif, said: “We have many thousands of products, and tracking citations for all of them is very labor intensive. We carried out a project with CiteAb previously and that resulted in our ability to display citation information for each of our antibodies, on each individual antibody page. While CiteAb’s public search function remains antibody focused for now, our development team is working hard to change this and expand our offering to researchers too. We’ll be announcing details about this soon so do keep an eye on our blog or subscribe below for updates. We will also be releasing some highlights of the data for the new reagent types we’re covering over the coming months – another good reason to get yourself signed up to our alerts! If your organisation is interested in exploring how we might be able to help you with data on chemical probes, proteins or ELISAs, please contact us and we’d be more than happy to discuss your needs with you.